In this article, we show how to develop apps with the Angular 2 MockBackend class, providing a way for front-end teams to become independent of the back end, and a useful interface that reduces the risk of structural changes. Getting your front-end and back-end teams up to full speed is certainly something each company is looking for. Often, though, teams fall into the pit of blocking dependencies. Those are situations where the upcoming work of one team is blocked by a user story owned by the other team. One of those examples is the communication process between the front- and back-end. 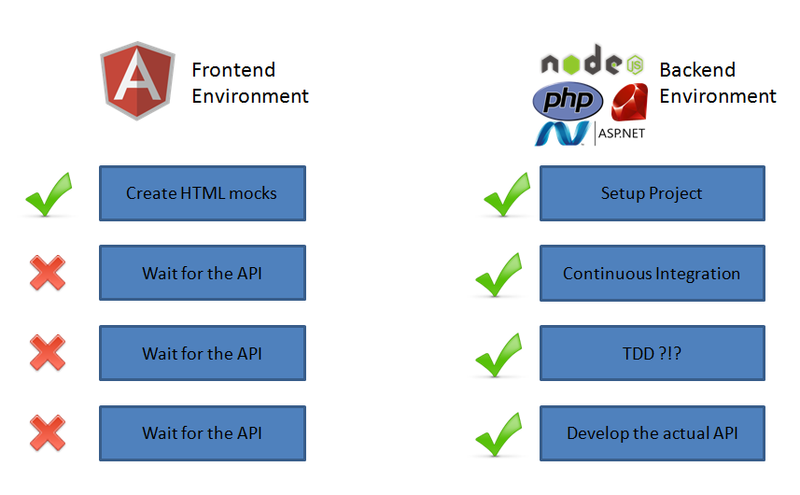 Over recent times, REST APIs have ascended the throne of so-called communication standards. The benefit of using JSON, a simple yet effective data transfer format, is that front-end workers don’t need to care about the actual back end anymore. Whatever crosses the wire is directly consumable and may be leveraged to bring data into your application. So it’s not surprising that those elementary entities often don’t get modeled at all on the front end and are consumed as they arrive. This brings us to the fundamental problem of having to wait for the back-end team to provide something useful. As depicted in the following figure, we see that both teams start in parallel, but at a certain time one team is kept waiting for the other to catch up. Besides this, having no kind of fixed structure makes each change a potentially dangerous one. So the focus of this article is to present a way that front-end teams can become independent of the back end and at the same time provide a useful interface which reduces the risk of structural changes. This article has been updated in line with the recent release of version 2.1.2 of Angular. The linked Plunkr example app has also been updated. In order to achieve that independence, it’s imperative to start thinking upfront about your project. What entities are you going to use? What communication endpoints result therefore? This can be done by creating a small table highlighting the necessary REST endpoints and describing their purpose. Remember the reason we’re doing that upfront is for both parties to agree upon a common structure for communication. That doesn’t mean it has to be perfectly done, but it should help you get started with the most important steps. As time passes, just update your interface accordingly with the new routes needed. The actual process of creating a back-endless environment is to capture all HTTP requests and instead of letting them go out into the wild, and reply with a fake response containing the information we’d like to have. This article will demonstrate the approach by describing a simple ticketing system. It uses the endpoints shown in the following table. Note that the example utilizes the POST verb for both the update and create route. Another option would be to leverage PUT for the update process. Keep in mind, though, that PUT should be idempotent, meaning every consecutive call has to produce the same result. Feel free to choose whatever suites your needs. Enough theory, let’s get our hands dirty with some coding. The project structure shown here is built upon the proposed Angular 2 Getting Started guide. As such, we won’t waste too much time explaining every part of it. If you’re searching for a introductory article, take a look at Getting Started with Angular 2 using TypeScript. For this article, you can just open up the above-mentioned Plunker to follow the code parts explained below. As most single page applications start with an index.html file, let’s take a look at that first. The first section imports the necessary polyfills. Followed by that we can see another reference to system.config.js which, amongst other things, configures third-party dependencies and Angular’s application files. The Reactive Extensions (Rx) aren’t actually a true dependency but simplify the work with Angular’s observables, which are the replacement for the previously used Promises. I highly recommend this article by Cory Rylan to learn more about this topic. Note that manual script referencing is not the recommended way to create production-ready apps. You should use a package manager like npm or jspm. The later one works hand in hand with SystemJS, described in section two. SystemJS is a module loader previously based on the ECMAScript 2015 draft and now part of WHATWG’s Loader specification. As such, it enables the use of the import x from 'module' syntax. In order to use it properly we need to configure it inside the previously mentioned file system.config.js and then import the application’s main entry point app, which points to the file app/boot.ts. This article won’t deep dive into details of the system.config.js as those are just an example, based on the Angular Quickstart example. Finally, we create the app by using a custom tag named my-app. Those are called Components and are somewhat comparable to Angular.JS 1.x directives. The file boot.ts is used to bootstrap Angular into the my-app component. Together with all application-specific code, it’s located inside the folder app. Inside boot.ts we’re going to perform the first steps necessary in order to leverage a mocked back end, which will act as a substitute for the real back end. We start by creating a root module, to house our application. Its provider section is used to tell Angular’s DI (dependency injection) system which actual instance of a class we’d like to use and what dependencies it requires. BaseRequestOptions provides general http helpers and MockBackend registers an instance of a mock implementation, which we’re going to use to create our fake replies. If we look at the third provider configuration, creating a custom instance of the Http service, we can see that the requested dependencies (deps) are passed on to the useFactory method. Those are then used to create a new instance of Http. The imports property is then used to declare additional module dependencies, followed by the declarations, registering all availble components of the root module. This module-wide registration enables each component to know what’s available, without having to explicitely state directive requests as in previous versions of Angular 2. The last property, bootstrap, is used to state which component should be the entry point. Finally, the method bootstrapModule is used to kickstart the app. The class MockBackend is originally meant to be used in unit testing scenarios, in order to mock real server calls and therefore keep unit test runs quick and isolated. You can read more about this in the official Http Documentation. It’s now time to take a look at the finished application to identify the components we’re going to work with. As with every Angular 2 application, there’s a so-called AppComponent, which acts as the main entry point into the application. It also can be used as a container, showing the general navigation and hosting sub-components. Speaking of these, we can see the TicketComponent being used repeatedly to display multiple ticket entities. The app component is configured to be used with the selector my-app, loading the template index.html located in the templates subfolder. 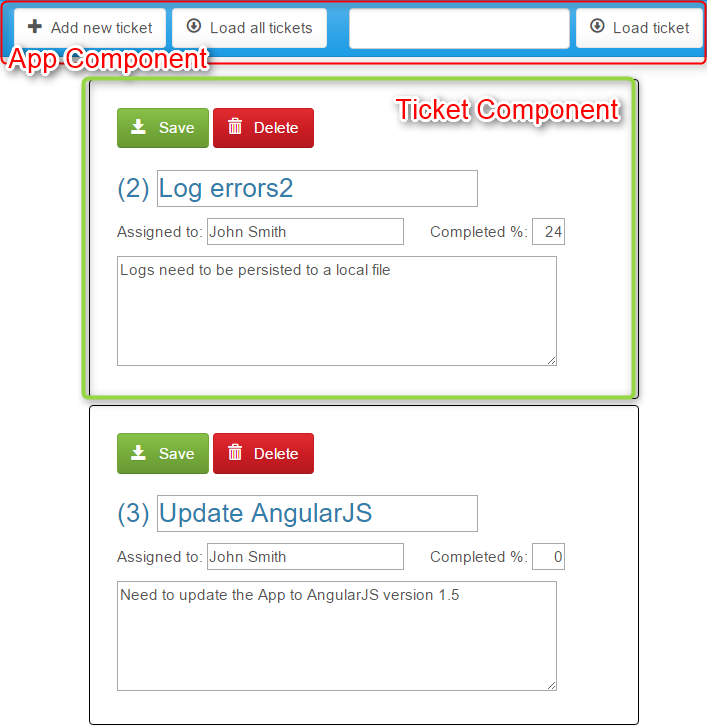 Finally, providers tells Angular’s DI that we’d like to obtain an instance of the TicketService. Next we define a db class property, which will hold a set of fake Tickets. The constructor now receives the injected TicketService as well as the fake back end. In here, we now subscribe to the connections stream. For each outgoing request we’re now going to check its request.method and request.url in order to find out what type of endpoint is requested. If the proper route is matched, we reply using the mockRespond method, with a new Response containing the expected result as body which is initialized with the class ResponseOptions. When requesting a single ticket, we use the singleTicketMatcher defined above in order to perform a regex search on the request.url. After that, we search for the given ID and reply with the corresponding ticket entity. In case of updates and the creation of new tickets, we get the ticket entity delivered via the request body instead of a query parameter or URL pattern. Besides that, the work is pretty simple. We first check whether the ticket already exists and update it, otherwise we create a new one and send it back with the response. We do this in order to inform the requester about the new Ticket ID. Last but not least, the page life cycle hook ngOnInit will trigger the loading of all tickets when the component is fully rendered. In a real production app, you’d separate the mock setup into a separate service and inject it as a dependency into the AppComponent. Or even better, you’d create a whole new module housing your fake server and add it to your app’s root module. This is omitted here in order to keep the demo simpler. Looking at the TicketComponent we can see that nothing too interesting happens, besides the Component decorator. We define ticket as the selector and again point to a separate template file. Now, in contrast to the AppComponent, we expect a ticket tag to be created with an attribute named title as well and getting the to be rendered entity. The constructor then finally gets the TicketService injected and assigns it to a class property service. The last thing missing is the TicketService, used to abstract the Ajax calls away from the components. As we can see, it expects the http service to be injected. Now, remembering the initial boot.ts file, we know that the instance provided will be the one with the mocked back end. The actual request stays the same by leveraging the HTTP services request methods like post or get, mapping the result — which in this case will be the fake reply — and proceeding with the custom application logic. Summing up, we saw how Angular’s dependency injection can help us to replace the default XHRBackend of the HTTP service with a mocked back end. Inside the AppComponent, we then created our fake database, intercepted every outgoing request, and replied with a custom fake response. The benefits we’ve gained are now complete independence from the back-end team and, at the same time, a defined interface. Now, once the production back-end is in place, all we need to do is to remove the dependency injection override and faked back end, and we’re good to go. This article was peer reviewed by Dan Prince and Rabi Kiran. Thanks to all of SitePoint’s peer reviewers for making SitePoint content the best it can be!